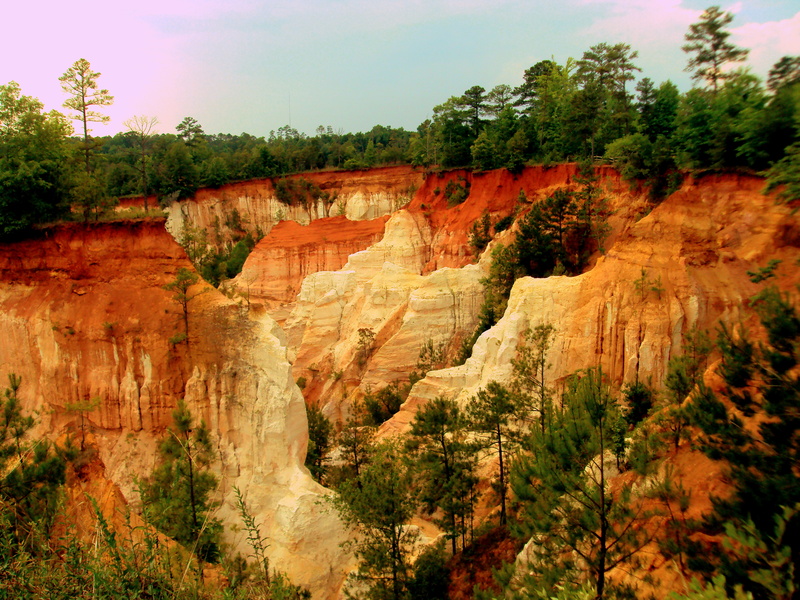 Providence Canyon State Park is truly breathtaking. Both of its own accomplishment and that it exists in Georgia–so close to home and not out West with all the other canyons galore. The colors are vibrant, the formations dramatic, and each vantage distinct. Due to poor farming practices, the soft soil began washing away when trees were cleared to plant crops. And the canyon grew. Some ditches are now as deep as 150 feet. Forty-three shades of soil paint the landscape, and the contrast of Georgia red clay with white limestone is stark and powerful. What surprised you to find out it was in your home state? Whether natural wonder or fascinating (odd) museum? Beautiful pictures – I love the one of the tree growing through the old truck. Thanks. There was an old farmstead on site and there were tons of rusted cars scattered across the landscape. That’s my favorite, too! My name is Katy Flinn and I am a part of making Exodus Magazine, a student publication at Samford University. I wrote an article about Providence Canyon and was wondering if you would let us publish this photo you have of it in the magazine? We would credit you, of course.